Asahan River is a major river in North Sumatra province. 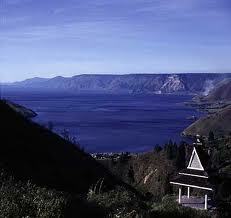 This river has upstream in Lake Toba, flowing through the dam Sigura Gura. Asahan River flows through several areas in Asahan District and empties into the Gulf Nibung, Strait of Malacca. Topography found along the river is very winding, bumpy, steep, and flanked by steep cliffs. While the river water that flows on average conditions are heavy, choppy height, and with high water discharge. Discharge of water flowing in this river reach 120 cubic meters per second with an average depth of about 5 meters. The rapids, dangerous terrain, and extreme conditions make this river as one of the favorite places for river rafting sports activities. As the location of river rafting sports, by international rafting rivers sport lovers are categorized as the third best in the world after the Zambesi River in Africa and the Colorado River in the United States. With the difficulty level of this river is between 4 to 5. If tourists come from outside the area and want to stay, they can rent rooms in people's homes are rented. Meanwhile, to meet the logistical needs, the tourists are advised to prepare themselves before leaving for Asahan River area.